Outside Zimbabwe, Anti-Government Pastor Takes Stock Of His Movement : Parallels Evan Mawarire posted a YouTube video in April that sparked the anti-government #ThisFlag movement. "We are the heroes we've been waiting for," he says. Evan Mawarire poses with a Zimbabwean flag in Harare, Zimbabwe, on May 3. He was arrested in July for inciting violence and disturbing the peace and left the country after he was released. Evan Mawarire, a Zimbabwean clergyman, rose to prominence in the spring, when he draped the national flag around his shoulders and took to YouTube to call for change in his country, which has been ruled for more than three decades by President Robert Mugabe and is beset by chronic economic problems. "This flag, every day that it flies, is begging for you to get involved, to say something, to cry out and say, 'Why must we be in this situation?' " he said in the video. It went viral and sparked a movement hashtagged #ThisFlag on social media. 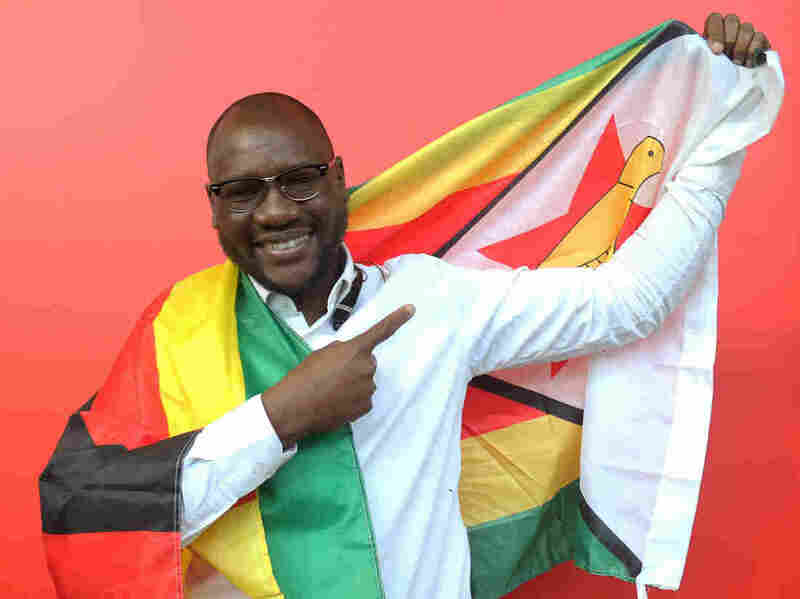 "It was the last thing on my mind that this would be a movement that makes a political statement," Mawarire, now visiting the United States, tells Farai Chideya on Weekend All Things Considered. "It really just started off as one video, and then after that, I said, 'Hey, if you want to reclaim your love for Zimbabwe, get the national flag, drape it around your neck or around yourself or get your family, hold it together, take a selfie, take a picture, post it on social media and let's just love Zimbabwe again.' "
The movement prompted strikes and protests against the government. After a shutdown on July 6, Mawarire, 39, was arrested for inciting public violence and was subjected to threats. After he was released, he fled the country. Now some of his supporters feel betrayed. But he insists his departure is temporary. "Zimbabwe is my home and I must return to Zimbabwe," he says. Over the last 20 years, it has become obvious that Mugabe and the ruling party are not really interested in letting anyone else build Zimbabwe. I think for them, the belief is that their way is the only way and it's really unfortunate because we revered them ... and we wanted to take the development of Zimbabwe to the next level. These are young people that had new ideas, fresh ideas, they had energy. ...We haven't finished the job of liberating the country if we don't hand over the country to those that we fought for to enjoy the country. So that's why it resonates. One of the changes we want to see is a government that has zero tolerance towards corruption. That allows the kind of investment that the nation needs without demanding brown envelopes from investors or without abusing public funds. We're also wanting to see the kind of change that allows our education to go to a place that advances the nation forward. Right now the learning conditions for our young people are deplorable. We want to see a nation that provides jobs for its young people. We want to see a nation that allows Zimbabweans to come back home and build despite their dissenting views of what the government policies may be, without intimidating those people. We want to see a Zimbabwe that respects the rights of humans. Right now our human rights record as a nation is deplorable. There are those that support him because they genuinely still believe that he's a good man and genuinely still believe that the ideals that he stood for in the war [of independence from Britain] and in the early days of his government are still what he stands for. And that's OK. Then there's another camp of people that support him because of the benefit that they get from the continued rulership of his government, through the different vehicles of corruption. It's one of those things that again works against the progress of Zimbabwe sometimes, in that people are more prepared to protect their own personal belief or their own personal good rather than for the good of the nation or the future of the country. What we had done is that we had encouraged people not to go to work as a way of registering discontent. ... So we went in for questioning with a charge against me of inciting public violence, even though in my social media videos, I had always and continue, even up to now, to advocate for nonviolence and for peace in our protests. They arrested me. ... I was kept overnight within police cells and then the next day, I had to go and appear before the magistrate and that's when the drama really began to unfold. ... Thousands of people gathered at the courthouse in support chanting for my release. ...They changed the charge from inciting public violence to subverting a constitutionally elected government. ... My lawyer who was there also informed me that about 100 other lawyers had showed up at the court to come and help to defend me and that was amazing. Right there is where I started to have a sense that something really amazing was taking place. ... Eventually, the magistrate had no choice but to release me. On coming out of the court, it was incredible. I saw thousands of people that had come to the courthouse. ... It was amazing to see and so humbling to see Zimbabweans come to a place where they were bold enough to say to a government that is known to be harsh, "Enough is enough and we won't let you treat citizens the way that you are treating them." That added to the momentum of the citizens' movement that we now have on our hands. We don't always have to put ourselves in mortal danger to bring about the change we want. ... The fact that remains ... that we have a government on our hands that must be held to account. In my original video, I talk about what this flag means and how it's a promise to me as a Zimbabwean and how that promise has been broken over the years. And how the only way the promise can be whole again for the future generations is if Zimbabweans themselves take that flag and start to put it back together again. ... It suddenly became, "Wait a minute, we have a voice here." I think one of the things that caused it to crystallize on the ground was that the government [tried to kill] our campaign on social media and they called us "regime-change agendas that are sponsored by the West" — which is rhetoric they've had for years. ... The government has been so shaken that at one point they tried to shut down social media ... but it's unstoppable. Zimbabwe is in a season of change that cannot be reversed. Everything we have done has been funded by Zimbabweans, and when I say funded by Zimbabweans, I'm talking about where people are, they pay with their own money. I may have been the starting point, but every Zimbabwean carries the torch wherever they are. It's not about me carrying the torch or giving it to a personality or giving it to a savior kind of personality. Every Zimbabwean has to understand that we are the heroes that we have been waiting for.